I first came across dual wavelength copper laser in the 1990’s during my resident years at the university hospital’s dermatology clinic. At the time the copper vapor laser was newly introduced at the hospital and I took on the role of setting the first parameters and explaining the usage to other doctors. Naturally, I read a lot of literature about this laser and learned many of its features. Based on this experience, I published a paper titled ‘Dual wavelength laser treatment with copper vapor laser,’ the first paper to deal with this topic in Korea, and related materials were also introduced in the Journal of American Society for Laser Medicine and Surgery and the Journal of Australasian Society for Dermatology Research. Korean hospitals in the early 90s did not enjoy the vast array of lasers that are available today. Especially, there was a lack of knowledge on the dual wavelength copper vapor laser that works on both pigmentary and vascular lesions. This laser has a special place with me as it provided the first opportunity for me to start using laser treatment and understand the basic principles involved. I led a workshop in the Philippines with 80 local doctors in June, 2013. The dual wavelength COPPER BROMIDE laser was first introduced to the Philippines at this workshop to great enthusiasm of the local specialists. 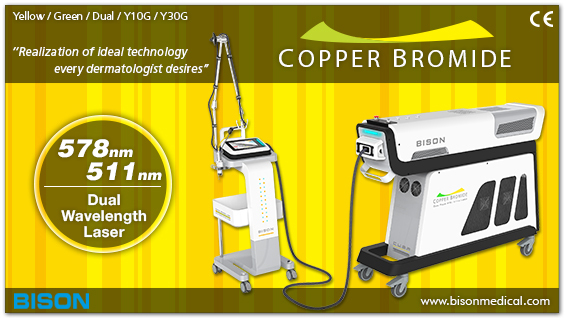 The COPPER BROMIDE laser developed by BISON MEDICAL produces two wavelengths of Yellow 578 nm and Green 511 nm from a single tube and can select one of five combination modes depending on the indication. The wavelength of 578 nm (Yellow) is very close to 577 nm, one of three oxyhemoglobin’s absorption peaks. Therefore, it is not readily absorbed into normal skin tissues while being selectively absorbed into oxyhemoglobin within blood vessels to effectively destroy vascular anomaly. The wavelength of 511 nm (Green) has high absorption rate in melanin and thereby selectively destroys it. The COPPER BROMIDE laser treats both pigmented and vascular lesions and thus has a wide range of indications including melasma, blemishes, freckles, facial flushing, erythema, acne erythema, telangiectasia, hemangioma, acne papules, seborrheic keratosis, psoriasis, raised lesions, and brightening. Different from other lasers for vascular lesions, the COPPER BROMIDE laser does not rupture the blood vessels but gradually destroys them, thus causing minimal bruising and crust formation. In blemish removal of heavily pigmented skin, it entails a short downtime and has low risk of dyspigmentation. This laser treatment is particularly effective and satisfactory for combined vascular and pigmentary lesions such as vascular melasma. As it causes very little downtime, the patient can wash or apply make-up immediately after the procedure. Professor Kim Beomjoon of Chung-Ang University Hospital reported the COPPER BROMIDE laser’s dual wavelength is effective on epidermal melanin pigment, dermal vascular anomaly and VEGF expression. He also added that the COPPER BROMIDE laser, with its antiangiogenic effect, treats melasma and delays its reappearance. This laser treatment visibly brightens the overall skin tone immediately after the procedure and has low risk of side effects such as dyspigmentation, bringing high satisfaction to both the patient and doctor. In combination with other available treatment devices, COPPER BROMIDE laser may bring more focused and dramatic treatment effect. The 10-15 minute preheating time and learning curve are the few drawbacks, however, the COPPER BROMIDE laser allows dramatic treatment effect depending on the skill level of the doctor, which sets it apart from other standardized laser devices. Doctors can use this special characteristic to differentiate their clinic from others. It also has the potential to treat other lesions outside the known basic applications and can open a new chapter of laser treatment for the doctor.